A truckstop near the top of Cunninghams Gap in Queensland goes that extra mile to make truckies happy. Fisher Park Pacific Petroleum service station will fill your rig up for you while you grab a free bite to eat. Customer service for truckies surely doesn’t come much better than this. When you pull up at the bowsers at the Fisher Park Pacific Petroleum service station at Tregony, 45km east of Warwick in Queensland, Frank Orazio will fill your rig up for you. While you wait for Frank to fill the tanks, you can walk into the shop for a quick toasted sandwich or order a proper sit-down meal of meat, chicken or fish with salad or fresh vegies cooked daily. "It gives the boys a chance to get away from the truck and have little bit of a chill out, even if they just grab a sandwich," says Jenny Brook, who looks after the shop and restaurant side of things. And that sandwich is free, along with a complimentary cup of real coffee or other drink of your choice if you buy more than 500 litres of fuel. There is enough room at the bowsers for three B-doubles, two of them with high flow pumps both sides. There is also an AdBlue pump, and trucks can enter from and leave in both directions. 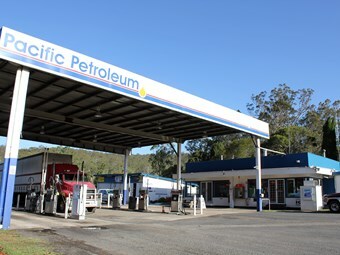 Pacific Petroleum is an Australian owned ExxonMobil fuel distributor, with most of its outlets in south-east Queensland. The dining room will be expanded soon, from the current seven tables, and adding a small lounge area. There are toilets and showers out the back. Topping off the good service, if you park up overnight and want to be doubly sure to wake up on time, Frank will give you an early morning knock on the door. The Fisher Park Pacific Petroleum service station is Owner//Driver’s Truckstop of the Month for March. You can read the full story in the March edition of the magazine.